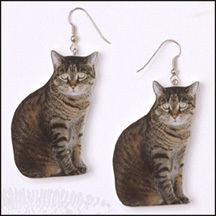 If you really want something different, try FotoArt's photo earrings. 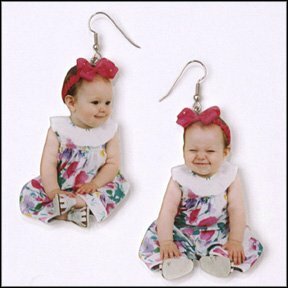 Have a set made from your favorite photos (maybe one child on each ear) or your pet. One client even had a set made of each grandchild and wore a different set every day of the week. We will use first uploaded file for both earings if only one file is uploaded. Or upload a second file to use different image for each earring. I love these earrings! The fact that 2 different images can be uploaded is great! I will recommend these to anyone who compliments me on mine, and I know that will be a lot of people. Have gotten several pairs of earrings from FotoArt, and have been happy with all transactions. Great work! This is the second item I have ordered from your company. Both times I have been pleased with the quality of the products and quick service. The earrings are perfect! Exactly like they were pictured. Looking forward to ordering something fun from you next year! These earrings are the cutest idea. I purchased them for a xmas gift for the mother of a new baby. I can not wait to give them to her. The photo resolution was great and the customer service was outstanding. They keep me in touch the entire process.